Standard Chartered is a leading international banking group committed to building a sustainable business over the long-term. We operate in some of the world’s most dynamic markets and have been for over 150 years. More than 90 per cent of our income and profits are derived from Africa, Asia and the Middle East. 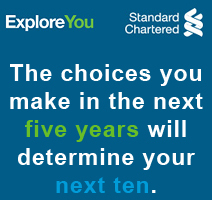 Standard Chartered provide a wide-range of products and services for personal and business customers across 68 markets. We understand. But you′re about to make one of the biggest decisions of your life. You′ll be taking the first step in your career journey. And even though it might be difficult to imagine, the decisions you make in the next five years will determine your next ten. So it′s important that you take the time to explore what′s right for you before you apply, because what you choose now matters. Even if you aren′t sure what you want to be doing in ten years time, a foundation in banking can set you up for success. But first you need to understand if banking is right for you. Explore You. And discover where banking can take your career. To us, good performance is about much more than turning a profit. It's about showing how you embody our valued behaviours - do the right thing, better together and never settle - as well as our brand promise, Here for good. We're committed to promoting equality in the workplace and creating an inclusive and flexible culture - one where everyone can realise their full potential and make a positive contribution to our organisation. This in turn helps us to provide better support to our broad client base. Payments Manager in ensuring delivery of high quality service to customers in the processing of payments while projecting a professional and warm image and ensuring that an optimal level of operational risk management is in place. Ensure proper and efficient filing of all documents under your custody. Familiarize and adopt group policies and procedures. Learning attitude in areas of local exchange, Cash, Trade , and financial market operations as responsibilities are assigned. Sound knowledge and understanding of the provisions and definitions of Local Exchange Control regulations and laws in Angola. Good understanding of transaction work flows and procedures. Multi-skilled in the handling of all Exchange Control transaction processing. Ability to work within broad policies / requirements and business objectives with only general direction. Good presentation with ability to communicate both orally and in written to all sort of audience.